A £4m refurbishment programme to transform the historic Marble Hall building in Derby into a managed workspace scheme has now been completed. The iconic former Rolls-Royce building on Nightingale Road in the Osmaston area of Derby has been empty since Rolls-Royce’s relocation in 2007 and is the centre-piece of Derby City Council’s Osmaston Regeneration Partnership in the heart of the Osmaston transformational Regeneration Zone. The Grade II listed building, which is one of the city’s most recognised landmarks, has been the subject of a major refurbishment to transform it into a business centre, with a vibrant managed workspace facility and a range of complementary facilities that are in high demand from the local community. The refurbishment of the building, which has been carried out by conservation specialists Woodhead Heritage and project managed by Sue Hunter from the regeneration project team at Derby City Council, (who has now joined Woodhead Heritage) included various structural works, including the installation of a new wiring and heating systems. to meet a BREEAM Very Good sustainability rating. The exterior of the building has also received a face-lift, with the refurbishment and installation of new windows. It will be the first venture for Connect in the Community, a new initiative which aims to attract and support social enterprises, voluntary, community groups and charities to the area, along with accommodation which includes 42 high specification offices for new start-ups and growing businesses. 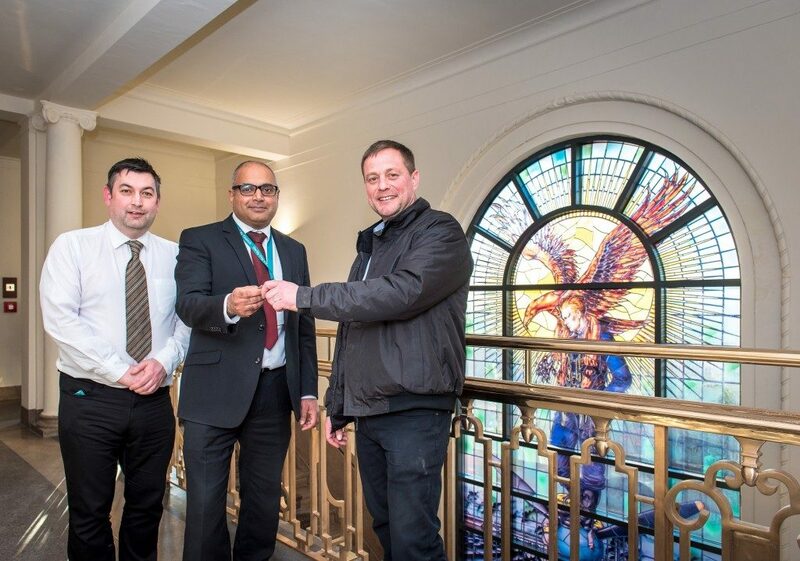 Left to right pictured: Councillor Martin Rawson, deputy leader of Derby City Council and cabinet member for Communities and City Centre Regeneration, Baggy Shankar, ward councillor for Sinfin & Osmaston and Paul Staniforth, Woodhead Heritage Site Manager.